From the left: Barnes Original #457010 Semi-Spitzer FB .458 300 grain, Remington 250 grain Accu-Tip, and the Parker 300 grain .451 Match Hunter. 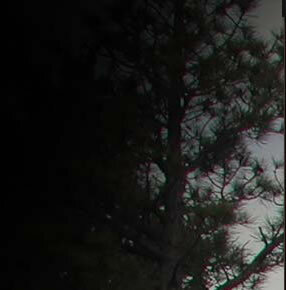 (Photograph by Randy Wakeman) These three are the most accurate projectiles in my Remington 700 Ultimate muzzleloader. 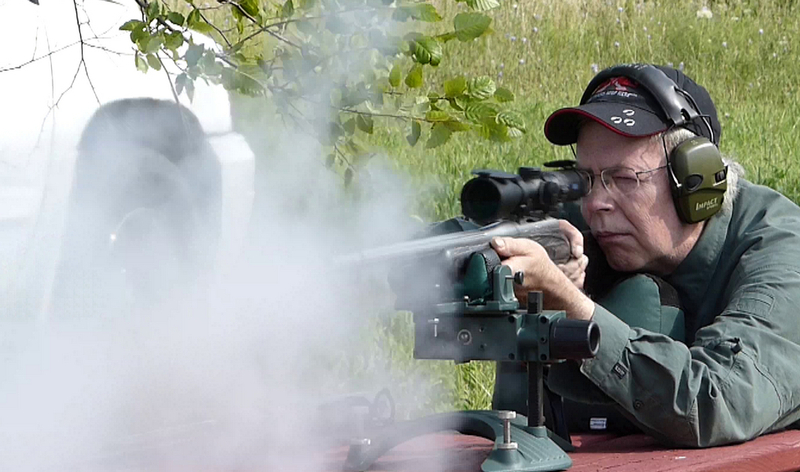 The Remington 700 Ultimate Muzzleloader, based on my test rifle, works well with essentially the same bullet and sabot combinations as discovered with the prior testing with the now-discontinued Savage 10ML-II. There are differences between the barrels, but they are subtle. The Savage 10ML uses a 24 inch barrel (22 inch usable barrel length), with a 1:24 rate of twist. The Remington has a 26 inch barrel (24-1/4 inch usable barrel length) with a 1:26 rate of twist. 136 grains by volume of Blackhorn 209, pushing a 300 grain sabot (above) is right at my comfort limit for practice. 130 grains by volume (91 grains actual weight) is noticeably softer to shoot, and is more strike velocity than I'll ever want, much less actually need, at typical hunting ranges: 1564 fps @ 300 yards with the 300 grain Parker Match Hunter.. The 100 grain weight charge of Blackhorn 209 is not a particularly comfortable load to practice with at the bench, so future testing will be with 91-95 grains by weight of Blackhorn 209. 100 grains by volume of Blackhorn 209 is about 70 grains of actual weight of Blackhorn 209, so a 95 grain charge by weight is approximately a 136 grain volumetric charge. 130 grains by volume is 91 grains by weight. Naturally, you can burning more propellant with lighter 250 grain projectiles than with 300 grain projectile and inflict no more sabot stress if you choose to. With 115, 120, 130, 136, and 143 grain volumetric charges of Blackhorn 209, the following bullets and sabots are all sub-MOA loads: twenty-five combinations thus far. According to Remington, you can use up to 150 grains by Volume of Blackhorn 209 in conjuction with 250 - 300 grain saboted bullets. You can also use up to 4 each 50 grain Pyrodex pellets, or up to 4 each 50 grain Triple Se7en 50 grain pellets, up to 4 each IMR White Hot 50 grain pellets, or up to 3 each Triple Se7en Magnum (60 gr.) pellets with the 250 grain Remington / Barnes Premier AccuTip saboted bullet. 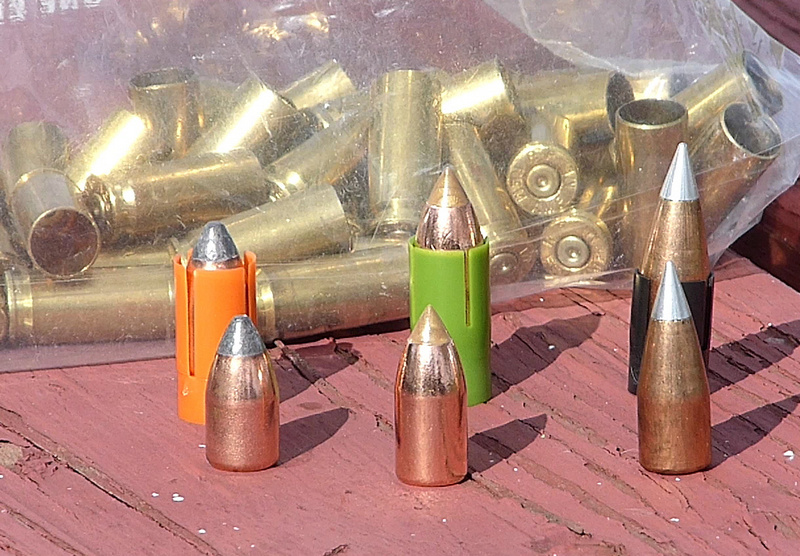 The simplest way to go if you prefer pellets, is two T7 Magnum pellets ('Red Box") for an average velocity of 2010 fps, with a 250 grain saboted projectile. I've tested T7 Magnums, and they work just as advertised. 2010 fps is the latest data, 9/24/2014. The most accurate pellets are IMR "White Hots," with most consistency / lowest standard deviations. With a 250 grain saboted projectile, two pellets produce 1714 fps, a very pleasant, low-recoil load. With three pellets: 2133 fps average velocity, as of 9/24/2014. IMR White Hots produce slightly less velocity than T7 pellets, essentially the same as Pyrodex pellets. One IMR White Hot pellet "50 grain" weighs 32.8 grains by actual weight on my RCBS scale. Importantly, they are the most accurate pellet, cutting group sizes in half in some cases. They are also produce less smoke than other pellets: better visibility is always a good thing. Further specific loads will be published, but not piecemeal. In the case of Blackhorn 209, Remington / Barnes has already tested it extensively. 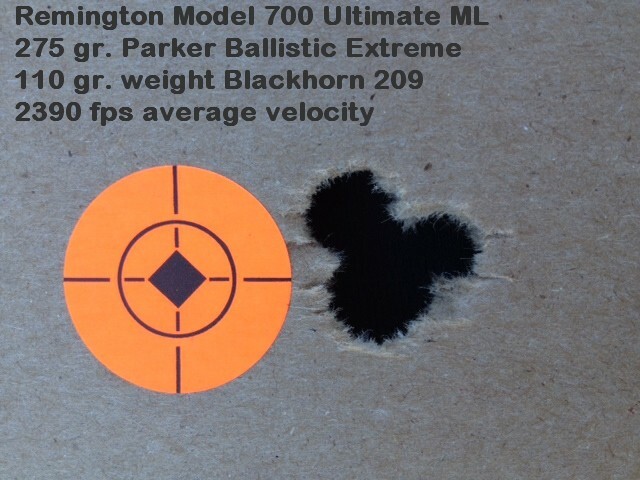 The folks at Blackhorn 209 will be testing "Remington Model 700 Ultimate Only" specific loads and velocities in the future. Note: 150 grains by volume of Blackhorn 209 produces higher velocities than "200 grains" of Triple Se7en pellets . . . with dramatically lower peak pressures. In fact, 150 grains by volume of Blackhorn 209 produces lower peak pressures than "150 grain" Triple Se7en pellet loads. Felt recoil with either load is uncomfortable at the bench, with 300 grain saboted bullets. In the case of my individual rifle, the two most accurate projectiles are the Barnes Original 300 Semi-Spitzer with the orange .458 / .50 MMP sabot and the Parker Productions 300 grain Match Hunter, with the short black MMP sabot. The new Federal Trophy Copper 270 grain B.O.R. Lock MZ is also quite a shooter, grouping 3/4 MOA. 150 grains by volume of Blackhorn 209 has about 100 fps better velocity than 200 grains of T7 pellets. The difference in muzzle velocity between a 250 grain saboted projectile and a 300 grain saboted projectile is about 100 fps. 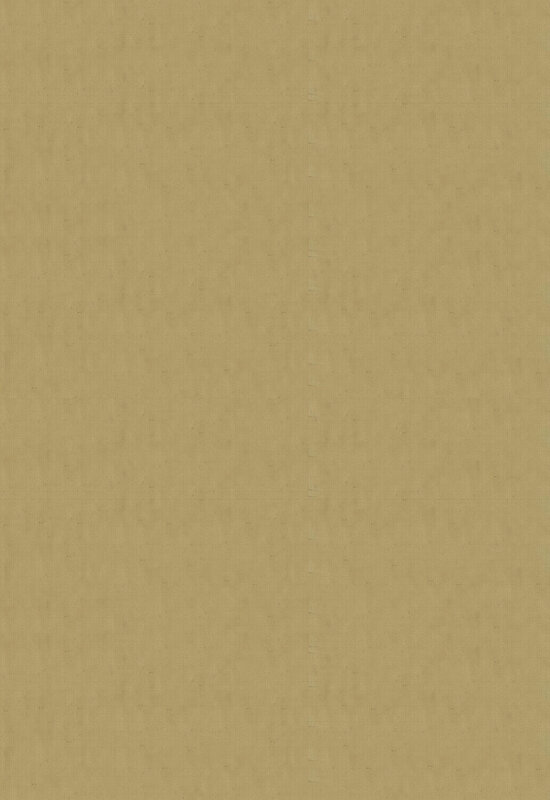 Note: the following is not a recommmended load. Nick Stevens of Farmington, New Mexico had this result with 110 grains by weight of Blackhorn 209 (about 157 grains volume) pushing a 275 grain Parker Ballistic Extreme. It has shot 1 inch @ 200 yards, and inside 2-3/4 inches @ 400 yards. 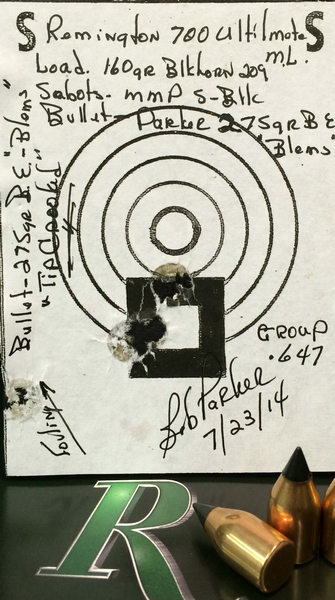 Bob Parker also had excellent results with the very same bullet out of his Remington Ultimate with 160 grains by volume of Blackhorn 209, with 160 grains by volume, recording .647 in. CTC, as shown below. 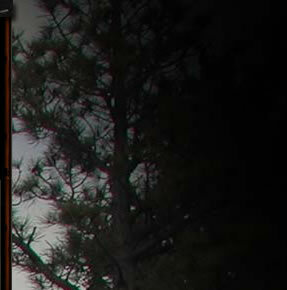 For Primed Brass: see http://www.shopremingtoncountry.com/Remington-Ultimate-Muzzleloader-Ignition-Source/dp/B00LDYKBBK?msbdm .